This makerspace-based elective will lead students on an exploration of robotics, computer science, mathematics, and art, using a variety of the latest technologies. 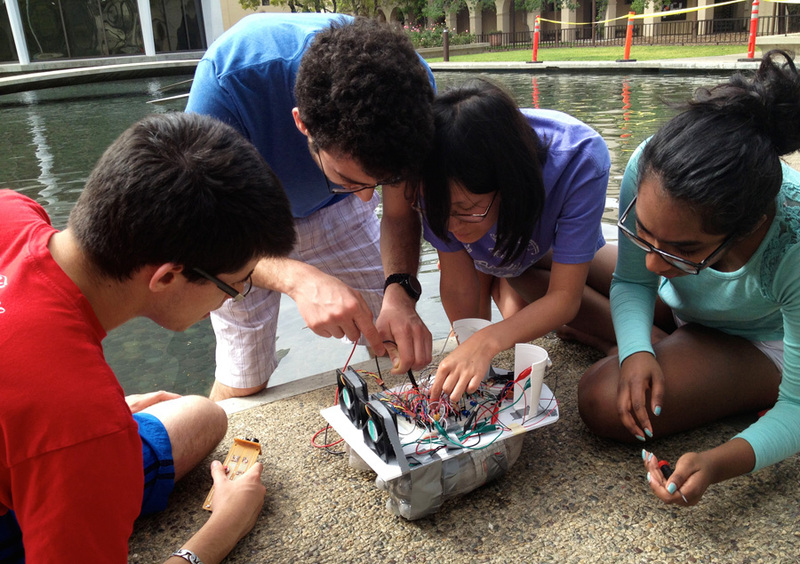 The course will begin with some 'tinkering' activities developed by San Francisco's famed Exploratorium, such as Scribbling Machines and Paper circuits, making artistic works with buzzing motors and blinking lights, learning basic circuitry and electronic tool use in the process. Following this will be an in-depth exploration of robotics, using the new Lego EV3 Mindstorm System, in which students will design and build advanced robots which respond to light, color, sound, and motion, and solving a series of challenges. Students will then explore game programming using the SCRATCH visual programming environment and the Makey-Makey (both developed at the MIT Media Lab), applying some of the mathematical concepts learned in 8th-grade algebra, to make games of their own design which respond to both keyboard commands and DIY(do-it-yourself) sensors. We will then make a brief excursion into text-based programming and electronics, combining Arduino micro-controllers with lights, sounds, sensors and motors. Time permitting, students will work on an original project of their own choosing, exploring one of the above areas in greater depth. While this course does not require any specific prior knowledge, it does require a willingness to problem-solve, take artistic risks, and learn independently.